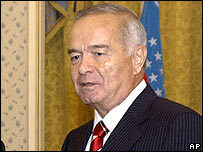 The United Nations Committee Against Torture has expressed extreme concern over allegations of widespread torture in Uzbekistan. Uzbekistan denies all the allegations made against it. The report this time coincides with growing international concern over human rights violations in Uzbekistan. The committee's report is nine pages long, and contains over 20 points of very serious concern relating to torture in Uzbekistan. Chief among them, allegations of the routine use of torture by law enforcement officials, the failure by the authorities to investigate allegations of torture, and the obstruction of independent human rights organisations trying to monitor the situation. Committee members said they had received hundreds of allegations of torture, all with corroborating evidence, and all following very similar patterns. As a signatory to the convention, Uzbekistan is required to appear before the committee at regular intervals. Uzbekistan's representatives in Geneva denied every single allegation - the committee's report, like all UN reports, is couched in relatively diplomatic language, but the conclusion is inescapable - if even a fraction of the reports of torture are true, Uzbekistan is in violation of the United Nations convention against torture. Uzbekistan now has one year to act on a series of recommendations from the committee - among them the introduction of a policy of zero tolerance to torture, and the practice of granting impunity to those who commit it.